"The discovery of these exceptionally broadly neutralizing antibodies to HIV and the structural analysis that explains how they work are exciting advances that will accelerate our efforts to find a preventive HIV vaccine for global use," says Anthony S. Fauci, M.D., director of the National Institute of Allergy and Infectious Diseases (NIAID), National Institutes of Health. "In addition, the technique the teams used to find the new antibodies represents a novel strategy that could be applied to vaccine design for many other infectious diseases." "We have used our knowledge of the structure of a virus—in this case, the outer surface of HIV—to refine molecular tools that pinpoint the vulnerable spot on the virus and guide us to antibodies that attach to this spot, blocking the virus from infecting cells," explains Dr. Nabel, the VRC director. "The antibodies attach to a virtually unchanging part of the virus, and this explains why they can neutralize such an extraordinary range of HIV strains," says Dr. Mascola, the deputy director of the VRC. The discoveries we have made may overcome the limitations that have long stymied antibody-based HIV vaccine design," says Dr. Kwong. -- Wu X et al. Rational design of envelope surface identifies broadly neutralizing human monoclonal antibodies to HIV-1. Science. 2010. -- Zhou T et al. 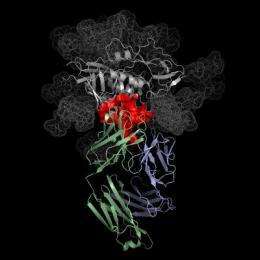 Structural basis for broad and potent neutralization of HIV-1 by antibody VRC01. Science. 2010. Even so, scientists have identified a few areas on HIV's surface that remain nearly constant across all variants. One such area, located on the surface spikes used by HIV to attach to immune system cells and infect them, is called the CD4 binding site. VRC01 and VRC02 block HIV infection by attaching to the CD4 binding site, preventing the virus from latching onto immune cells. I would assume the 10% have different CD4 binding sites.